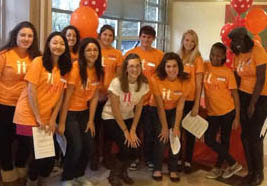 It’s Monday afternoon, Nov. 12, and the main hallway of the iSchool is filled with unusual activity—approximately 92 high school girls from across the country, along with several of their parents, are getting ready to showcase their final projects as part of a two-day program called It Girls. The It Girls Overnight Retreat is a slumber-party-meets-hack-a-thon organized and hosted by the iSchool. Its goal is to engage and inspire high school girls, while exposing them to their potential in technological fields, female role models and collaborative, hands-on activities related to the IT field. In its second year, the program has drawn about 30 more girls than last year. The girls had been going since the day before, when the event was introduced and kicked off by iSchool Dean Elizabeth Liddy and an inspiring keynote speech by new iSchool board member Liz Ngonzi, an expert in women and minorities in entrepreneurship, technology and leadership. The group went through a series of discussions on education and careers in technology, and several workshops facilitated by members of the iSchool and Syracuse University community. The girls were then put into teams and let loose in the Syracuse Tech Garden to come up with a hypothetical campaign that addressed the issue of why girls should be knowledgable about, and active in, breast cancer awareness initiatives. Hence the bustle on Monday afternoon to present their final ideas to parents, peers, current iSchool students, faculty and staff, and the many role models in attendance.